I don't often read graphic novels, mainly because I find myself just reading the words and not slowing down enough to fully appreciate the illustrations, but I AM trying to read more of them. So when the opportunity came to read this book, I couldn't pass it up. 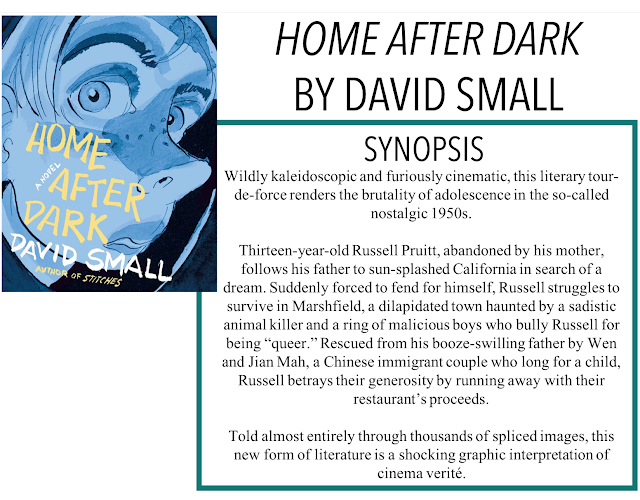 I am back with another book review, Home After Dark by David Small. Thanks so much to Penguin Random House Canada for sending me a copy of this book for an honest review, as always, all opinions are my own. This story follows 13-year-old Russell who, after his mother walks out, moves to California with his father. It's set in the 1950s, which I'm going to mark as historical fiction for the sake of semantics, and you can really see that time period come through with some of the characters' actions and words. This is a coming of age story, learning what it means to be a man, growing up with a Vietnam War veteran as a father and not being as hardened by the world as he is. The book touches on a lot of serious issues, some that were more rampant in the 50s, but some that also unfortunately persist today. Homophobia and racism are common throughout Russell's new community, from comments about his Chinese landlords to assumptions and hatred toward one of his new friends. I think Small really captures the suffocating hatred so common at this time in history - and even of today. I found the juxtaposition between this version of the 1950s and the nostalgic idealized version of the era (made the norm by pop culture) extremely powerful. This was a fairly quick read but an impactful one. Small didn't shy away from any real-life issues and made it seem like you were right there with Russell, experiencing everything with him. The grayscale illustrations made for an atmospheric read where the images really speak for themselves. In fact, there is very little text at all throughout the book. I do think, though, I was still able to understand what was going on and the lack of explanation made things even more powerful because you become a sort of removed figure from the story while still being a part of the story. Overall, this book really is just a slice of life that - for the most part - isn't really resolved. The viewer sees a part of Russell's life and, like him, just has to try and keep moving forward.